I walked through Kyoto Gosho which is old imperial palace. Today, the imperial palace is inTokyo. It was moved in 1869. There is a huge park inside of the Palace and everybody can go into the park. You can take a walk, sit down the bench or go running... and of course sight seeing! They have a tour with English speaking guide*. *You need to book before joining the tour. If you are interested in it, check out this website! this is our hotel staff on the picture. 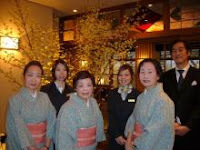 the staff who wearing Kimono they show our guests to the guest room and they serve dinner . and another staffs are working at the reception. we are not big hotel so we have many chance to talk with our guests and like to communicate with them . so when you see us please talk to us ! we look forward to see you at our hotel ! At Hotel Nishiyama we have public bath on the basement. This is not hot spring but our guests enjoy our public bath. we have private bathroom in every guests room. but this is quite small .so we recommend to use public bath. we have japanese Robe(YUKATA) for our guest after the public bath please try to wear japanese robe and enjoy japanese culture! we also have small robe for kids this is very cute when kids wear the japanese robe ! the picture is our public bath. I went to Uji last week . we could have lunch on the boat . there are very beautiful sakura both bank of uji river. Uji is very famous for green tea and we enjoy green tea ice cream there. There are many people enjoying sakura. Japanese people enjoy sakura with having foods and drinking. sakura is almost gone now we can enjoy sakura only this week.